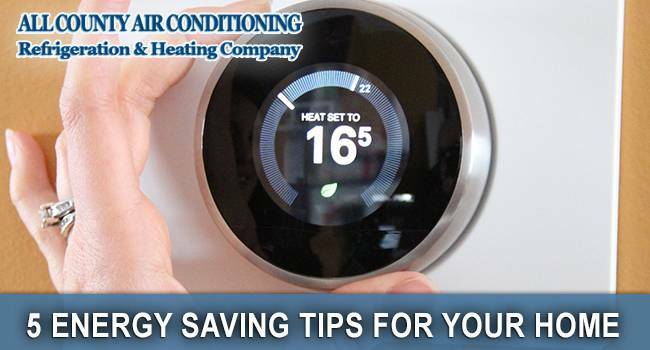 August 12, 2015 Energy Saving TipsJoe Sposa Jr.
With the temperature fluctuations on these time of the year, the ac is always on and adjusting itself to keep you either warm or cool inside your home. However, it can be challenging to fight the higher bills that come in these type of situations; it’s possible to sometimes reduce heating and cooling costs by as much as 10 or even 20 percent by following five energy saving tips. To make sure you aren’t losing energy anywhere in your home, this article could save a couple of extra bucks for the upcoming months! Leaving lights on can be a good example of the energy that is easily wasted. In order to reduce usage to a minimum, be sure to turn them off when leaving a room and also; look for low energy light bulbs. The refrigerator is another good place to cut energy costs. You can do this just by checking the temperature setting to ensure the fridge isn’t working too hard. Also, if your refrigerator happens to have a freezer, adjust it to a lower level. The door in the home can sometimes be one of the biggest culprits in energy loss, but you can nip it in the bud by using guards on the bottom of the door to keep the cool air in and the hot air out. Also, check in the door’s jam to ensure there are no unsealed areas. Windows can be a very big offender in lost energy. Often, a lot of energy is lost through the unsealed cracks around the frame. You can use clear caulking around these areas to keep cool in your home. In addition to weather stripping, you can also tint the window and block out the UV rays from the sun which causes a greenhouse effect in your home. Most pools and all sprinkler systems have pumps that run at some time during the day if they are not timed and you can save a lot just by knowing how these pumps work and when is the best time for them to be on. Sprinklers also can be on during the raining season, costing you money in energy as well as precious water, an invaluable resource nowadays. As you can see, there are many ways that you too can save money this year all by shaving lost energy of your electric bill. At All County Air Conditioning Broward, we take great care to keep our community informed. For more information click here on how you can save you your electric bill, or call us today at 954-297-9754 to make an appointment.